Perfectly Pamela: As the weekend winds down. Well this weekend just went by waaaaaay too fast! Mom and I didn't make it to David's Bridal like I hoped but we always have next weekend. I'll be back down in that area for my bridal shower next Saturday so I'll probably drag my mom out for a little shoe shopping! :-) I got home at about 5 pm this evening and had to go straight to working on homework/classwork for the ending week. As excited as I am to be working on my MBA I'll be glad when its over! 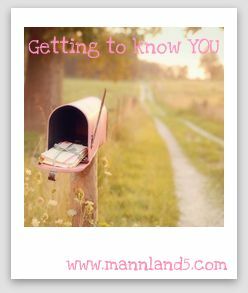 Tonight's fun link up is Getting To Know You Sunday from Mannland5. I honestly don't have one...but I do like lilies and roses just in general. Pedicure...I don't like how my finger nails look with nail polish on them. Hahaha honestly who doesn't or at least who hasn't? Wal-Mart. It's way to crowded and I can't stand the people that shop there, but sometimes I can't turn down the prices.